I love my Hermes scarves. But in order for silk scarves to work as (slightly more) masculine accessories I think they need to be both dark and low on contrast. Classic polka dots or stripes are different – they can get away with higher contrast, as can simple geometric patterns. For more elaborate designs the colour palette needs to be subtler. It’s a similar logic to tie patterns: bigger, illustrative figures like paisleys need restrained colours to avoid being brash. It’s one reason madders work so well – the matte quality of the treated silk can bear more flowery designs. Such designs are not that easy to find at Hermes, despite the ample ranges they bring out every season. The sample book may be as deep as it is wide, but there are few subtle combinations in there. When there are muted options, the designs tend to very simple and, well, a little dull. The carriage logo, perhaps, or a geometric pattern of Hs. Not exactly inspiring compared to the Russian country scenes or intricate globes elsewhere. The Rhythm of China range this season is a case in point – there are subtle grey and beige options, but the pattern is geometric and dull. The two scarves I own, shown here, are a couple of exceptions. 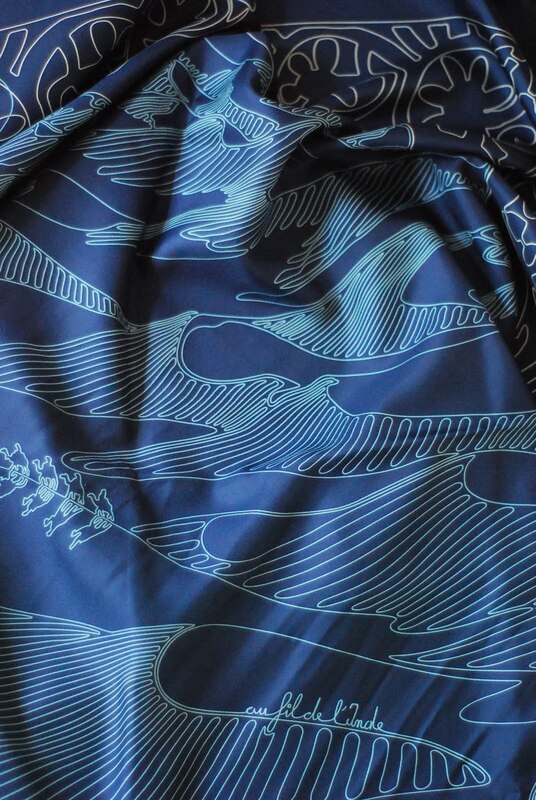 Au Fil de l’Inde, the first design, is a classic blue with a subtle, winding design showing escalating sand dunes – all drawn with a single line. When tied at the neck, there is little obvious difference to a regular, linear pattern. Just a touch more interest. The second, Brides de Gala, is a fairly classic Hermes design of equestrian equipment. But the dip dye technique makes the colours muted and the contrast low. Aubergine, navy and a dull gold. There’s no lack of interest but nothing jumps out at the eye. The current range of dip dye scarves offers nothing so understated. I normally wear the scarves tied in a square knot under a round-necked sweater, or in a bigger, triangular wrap to fill the gap in a jacket. They can perform the role of a neckerchief or a proper scarf, but are more individual than both. If anyone has any recommendations of designs that are still in circulation, please let me know. You can follow the discussion on My Hermes scarves by entering your email address in the box below. You will then receive an email every time a new comment is added. These will also contain a link to a page where you can stop the alerts, and remove all of your related data from the site. These scarves are beautiful and your observations equally so. 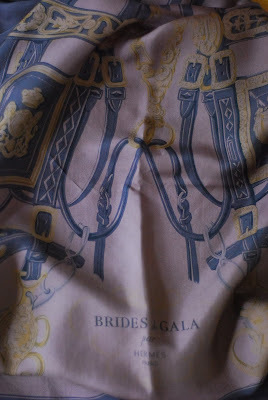 Adore both your scarves as well as your blog. I do have a recommendation of an Hermes scarf for you but will not know the name until I return to Manhattan and open the drawer. Until then, have a wonderful summer. Lovely post. Please feel free to visit my site and contact me if you would like help building your collection! Are u buying women’s Hermes scarves? Can you recommend anyone other than Hermes (because of budget) to buy quality neckerchiefs/bandanas? Results on a Google are not great. Not for silk, off the top of my head. What about cotton or other fabric? Anderson & Sheppard has some nice options, in the Haberdashery.